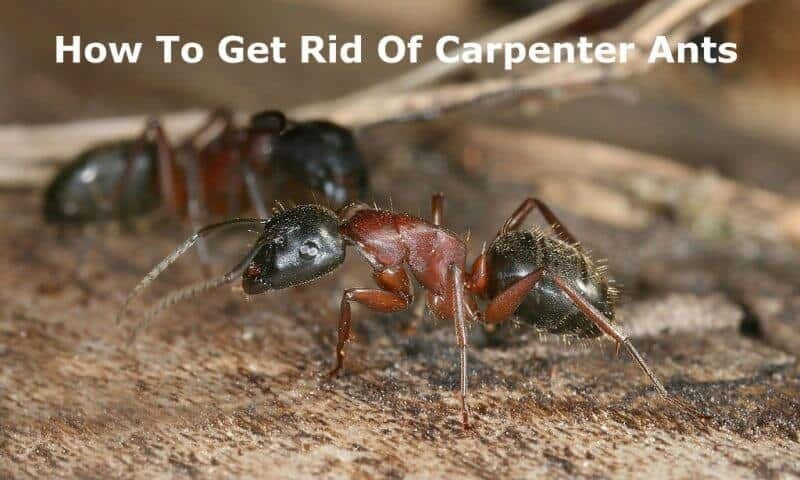 Whether you’re dealing with a small infestation or a massive plague, learning how to get rid of carpenter ants is much easier than you may consider. The best part? You can effectively remove these pests from your property without the use of harsh chemicals or toxic compounds. Before delving into the steps of learning how to get rid of carpenter ants, let’s take a few minutes and explore these creatures. As with anything in life, knowledge is power. Below you will find out everything you need to know about how to get rid of carpenter ants. While you may be familiar with these insects, it’s important to hold a solid understanding of these creatures. Perhaps the most important element you need to learn is how to properly identify a carpenter ant apart from any other insect. Throughout the world, especially in more industrialized nations, carpenter ants are among the largest variety of ants. Although there are several different species of carpenter ants found inside homes and other buildings, a standard worker ant measures anywhere from 3/8 to 1/2 of an inch long. The majority of worker carpenter ants, which are the tiny creatures you see roaming about your porch or on your picnic blanket, are black in color. However, they may also feature a combination of red and black. It’s important to remember not all carpenter ants are black; however, they are never as brightly colored as the more dangerous fire ants. When trying to identify carpenter ants, don’t solely rely on their size. There are many varieties measuring no greater than 3/16th of an inch long. While you may never see their queen, a queen carpenter ant can measure up to 1-inch, and possibly a little larger. Worker ants may be outfitted with wings, yet this isn’t always the case. The majority of carpenter ants you’ll come in regular contact with are worker ants. These ants come in a variety of sizes based upon their jobs and roles within the actual colony. Typically, carpenter ants establish indoor colonies. What’s interesting about these creatures is their ability to establish a main colony and multiple satellite colonies. The parent colony, which is like the “mothership” of the ant realm, is generally located outside and is much larger than the smaller satellite colonies. A single parent colony (and subsequent queen ant) can be associated with several smaller satellite colonies. Within the parent colony, there can be up to 40 queens reproducing a massive amount of worker ants. This is one of the reasons why carpenter ant infestations can swiftly bloom out of control. Although many carpenter satellite colonies are located indoors, it’s important to remember that these hives can be found both inside and outside. These creatures are quite interesting as they tend to prefer a variety of environments. In general, carpenter ants create nests in both moist and dry woods; however, the typical colony prefers to establish a nest in moist wood. Because of these, nests are generally found in moist wooden beams due to water leaks. For example, around bathtubs, sinks and near poorly sealed windows. It’s not uncommon to find a carpenter ant colony within hollow spaces of your home, such as chimneys or in the empty space behind your dishwasher or even in a hollow porch column. Because carpenter ants are “sneaky” in their actions, there’s typically no outward visible damage to theses areas. However, screwing a hole into the side of a wooden beam hosting a nest can reveal thousands of ants secretly living inside or around your home. In fact, a single queen can produce over 2,000 worker ants within her reproductive lifespan. 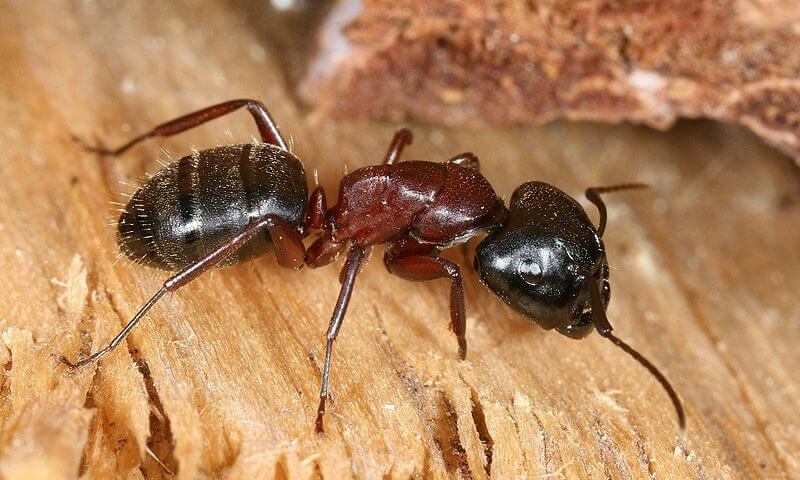 Because carpenter ants enjoy wood, many people mistakenly assume they eat it. These creatures are not like termites, which consume wood. Rather, they excavate wood to make their nests, which are an elaborate network of tunnels and galleries. Therefore, the primary danger associated with a carpenter ant infestation is the weakening of wood integrity. This is a major concern should carpenter ants delve into essential wooden pillars or beams for the safety of you home or outdoor area. When dealing with a carpenter ant infestation, it’s easy to forget that these tiny creatures play a vital role in the world’s entire ecosystem. As mentioned earlier, these creatures delve into wood to create their homes. In the wild, carpenter ants excavate into living tree heartwood or into the center of dead trees and/or stumps. By creating homes within dead trees, carpenter ants play a vital role in the process of wood decomposition. Therefore, these creatures are essential to maintain the natural balance of Mother Earth. Because of this, you shouldn’t strive to eradicate carpenter ants along your entire property. Rather, your goal should be to manage a carpenter ant infestation within specific, and isolated, areas. For example, if you have a large yard, place your primary focus on eliminating carpenter ants within your home, not within your entire property. However, if you have a small yard where ants are continuously finding their way into your home, then it may be necessary to move your management techniques out into the immediate surrounding area. Now that you hold a more solid understanding of carpenter ants, let’s begin the exploration into getting rid of carpenter ants. According to the leading ant control specialists, the most effective way to control and eliminate carpenter ants from your home is to locate and eliminate their nests. While, in theory, this seems easy enough, the reality can be much different. Locating carpenter nests is a challenge within itself. These creatures are masters at hiding their nests. Because a single colony can be made out of multiple satellite nests, which are fed by a single parent nest, even if you eliminate one nest, you’ll likely still deal with a massive ant infestation. Therefore, the most important quality to cultivate when dealing with carpenter ants is patience and persistence. Carpenter ants maneuver throughout your property through a complex scent trail. These insects use scent trails to navigate their way through satellite nests to food and back. Therefore, it’s important to spend time actually following their movement. Look at where they’re going. If you’re dedicated, you can actually follow them back to their nests. This process makes locating all satellite nests (and ultimately, the parent nest) much easier than blindly seeking them out. An effective tracking method is to place a dab of honey on the nonsticky side of a masking tape. Cut the tape into small squares and place the honey on it. Do this late at night as this is when the ants are most active. Once the ants have found the honey, they’ll take it back to their nests. This encourages the ants to gather and return to their nest, which makes locating it much easier. You’ll likely find that the ants disappear into a concealed location inside or around your home. Once you’ve located their nest, you must then begin the extermination process. Thankfully, there are ways to do this without using toxic chemicals or commercial insecticides, which pose a serious threat to animals and humans. Instead of calling upon the exterminating power of toxic chemicals to eradicate carpenter ants, sometimes a more gentle approach is best. Once you’ve located the nests by following the carpenter ants, you should now begin to safely eliminate them by applying boric acid into the nests. Boric acid is available at most hardware stores. When applied, this powder will disperse within the ant nests and ultimately kill them off. While its use is relatively easy and straightforward, its application must be precise for it to be effective. Let’s say, for example, the nests are located within a wall. Drill several small holes ranging from 3 to 6 feet from the area where you saw the ants disappear into your wall. Pour the powder directly into holes and allow it some time to work. After several days, you should notice the concentration of ants to dwindle. However, if you only attack one nest, don’t be surprised if these creatures aren’t completely eliminated. Getting rid of carpenter ants is a difficult task. Yet, with a little patience, you can safely and effectively eliminate these pests. The next step is to create a barrier along your home to prevent these pests from infiltrating it. One of the most effective ways to do this is to create a solution that eliminates their scent trails. To accomplish this goal, create a solution of water and vinegar (50% water and 50% vinegar) followed by adding 2 tablespoons of eucalyptus oil. Add 2 teaspoons of ground cinnamon and pour the entire mixture into a spray bottle. Thoroughly spray anywhere you see carpenter ants congregating or moving. You’ve likely noticed specific trails. Use this solution on all trails of ants. Repeat each day for maximum effectiveness. Sometimes, the most effective way to eliminate carpenter ants is to actively organize and fix your property to make it less hospitable for these insects. The first step is preventing moisture from accumulating in the wood inside or near your home. Regularly check your porch/deck wood for moisture erosion or areas near your home that remain moist for long periods of time. Good house maintenance is an effective way to ward off these pests. The next step is to repair existing carpenter ant damage and then re-seal the area to cut off ant access points. Follow this by doing a thorough investigation of your home and property. With the information you now have regarding carpenter ants, and where they like to nest, search your property for these areas. Remove wood debris and dead tree stumps while sealing hollow pieces of structural wood. Make sure that you prune branches away from your home. When a branch reaches over and touches your porch or roof, ants use this as a bridge to gain entry to your home. Be diligent with this process, as it’s one of the most common methods of ant invasions. Another effective method is to eliminate potential entries where utility lines enter your home. Use an effective sealant to block these entryways. When storing firewood, keep the pieces of wood off the ground. Make sure the wood is not only elevated but also stored several feet away from your home or another structure. This is among the most powerful ways to avoid a massive carpenter ant invasion. Lastly, to get rid of carpenter ants you should eliminate any and all potential food sources. Carpenter ants feed on many things we do. Therefore, never leave food unsecured within your home. Pack away food in sealed containers. Try to keep composting piles as far away from your home or any other structure as possible. If the carpenter ants have no food source, they have little reason to invade your home.